There is something so charming and magical about pixie hats on babies and children. They are whimsical and sweet and most importantly keep little heads warm and cosy. I love the Finley pattern by Dover & Madden. It’s a quick to knit and very easy to follow pattern with a wonderful finished result. Over the years I have made a few in various sizes. I also like the fact that I can use various yarns to create different sizes. Here’s one in green, using DROPS Baby Merino. Another one using DROPS Nepal, which is wonderfully soft against the skin. Such a gorgeous colour too. Another DROPS Baby Merino for a friend who has a son almost exactly the same age as my Max. The following made using DROPS Nepal too. Would you look at this sweet boy wearing his pixie hat? Isn’t he just the sweetest thing? His big smile. It warms my heart. This final hat was also made using DROPS Nepal. Just look at this wee man wearing his pixie bonnet. Just adorable. Pattern: Finley Pixie Hat by dover & madden. Yarn: Various yarns, including DROPS Nepal and DROPS Baby Merino. Knitting time: 2015 and 2016. What is it about little baby dresses that make you swoon? I love all the colours, all the lace and all the wonderful shapes you can make. A good friend from England asked me to make something that she was going to gift on. We settled on this sweet dress from Taiga Hilliard Design and since it was going to Australia it was made out of cotton. It knit up quickly, even though I used quite small needles. The pattern itself was so easy to memorise and follow it just flew off the needles. I love that vibrant pink and think it would look wonderful on any little lady. Pattern: Little Birgit from Taiga Hilliard Design. Yarn: DROPS Safran in cerise. Knitting time: 16th – 21st July 2016. It’s strange how you get used to knitting something one way, and then you do it another way and it all just falls into place. I used to only knit things like dresses and jumpers from the bottom up, but as soon as I had knitted one thing from the top down I immediately fell in love with this type of construction. This beautiful little baby dress is no exception. It’s a wonderful pattern by Ruth Maddock and can be found on Ravelry. I knitted this for a friend who I went to school with many years ago, who had a baby girl in 2016. According to my Ravelry details I knit this in December of that year. I used some pure wool yarn that I had in my stash, so I am unsure of the exact details, but I knew it needed to be warmer as my friend lives in Scotland. It was a quick knit and apart from the lace work on the yoke and the hem it’s very straight forward stockinette stitch. The lace pattern itself is easy enough to remember and the yoke repeats in them, which is a nice touch. I made one minor adjustment and did a picot bind off on them, which really completes it. I first did a picot bind off a few years ago, but reminded myself of how to do it with this article on Love Knitting, a great resource! My friend sent me a picture of her gorgeous girl wearing the dress, and doesn’t she look scrumptious? 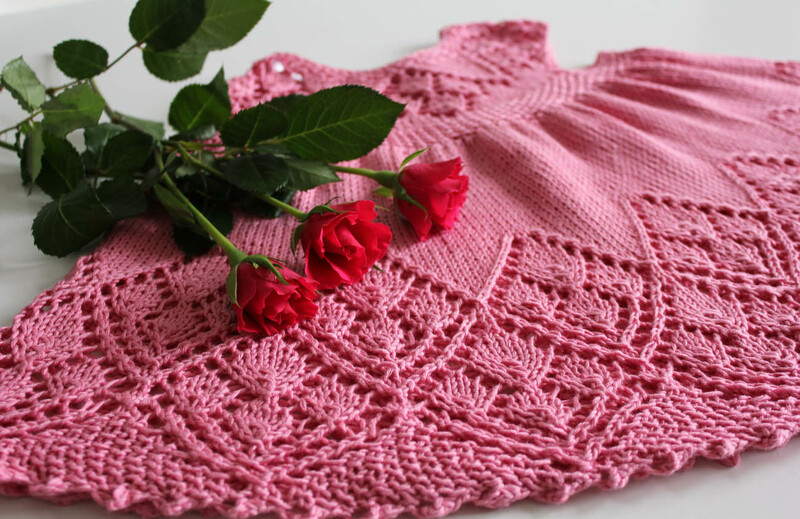 Pattern: Meredith by Ruth Maddock. Yarn: Lyncraft yarn, I am unsure of the details. Knitting time: 19th-24th December 2016. I finished this gorgeous little dress back in June 2016 for an ex-colleague of mine who had her second child, a little girl. I had knitted a beanie and some booties for her firstborn, a little boy. As I have two boys I always jump at the chance to knit something girly, especially dresses when I know someone is expecting a girl. It’s such an absolutely adorable pattern, the Lizzie Dress by Taiga Hilliard Designs. And even once it doesn’t fit as a dress anymore it can be used as a tunic. The dress that keeps on giving. It has the sweetest details on the yoke and the bottom of the skirt. I did add a picot bind off to the hem as well, just to add another sweet detail to it. The dress is knitted from the top down, so the length can be adjusted quite easily. And the lace panels from the yoke repeat in the skirt. I used some DROPS Safran I had left over in my stash, having picked the most perfect shade of pink. It couldn’t get any sweeter or prettier. And it flew off my needles in three days flat, it’s such a pleasant knit and easy to follow pattern. My friend loved it and she was kind enough to send me the sweetest picture of her little girl wearing her dress, it makes me beyond happy to see that. Pattern: Lizzy Dress by Taiga Hilliard Designs. Yarn: DROPS Safran in medium pink. Knitting time: 10th-13th June 2016. There are a few reasons why I haven’t blogged in a few months. The main one was that I moved from a UK-based hosting company to one hosted here in Australia and that meant a range of issues. For a while I even thought I had lost 10+ years of blogging. But a good friend came to my rescue and recovered it all for me. I am also very busy behind the scenes ramping up to launch a handmade business, I have hinted to it on Instagram, and there are a few teasers. It’s kept me very busy and I would love to say I am almost ready to reveal all, but there are still a fair few things to do. Of course, I have also still been knitting many, many custom orders. And of course life is all encompassing, after all the boys need my attention too. However, I want to get back to posting regularly and I want to show off my finished knits, after all there are many that I haven’t blogged about yet. First off, this darling dress I made for an ex-colleague who had a baby girl a year ago. It’s a wonderful pattern by OGE Knitwear Designs, it’s an easy to follow pattern that knits up very quickly. I love the sweet little details like the lace flowers and the picot-esque border at the bottom. I used a 4 ply 100% cotton from Paton that I was gifted years ago, I have this pink and a dark red still in my stash. I also found some matching buttons in my stash that I had bought in England from TextileGarden. I had made the dress before for another friend, but haven’t blogged about it yet. I am sure I will be soon. I am sure this could be made out of wool too, but as it’s quite fitting as a Summer dress I actually like the cotton. It was well received by the recipient too, which is always a bonus. Pattern: Sun Dress from OGE Knitwear Designs. Yarn: Patons 100% cotton, 4 ply. Knitting time: 10-13th September 2016. I love this sweet little cardigan, which I knit for her daughter in a size 3 years. My friend picked the colours and I love how the pink squirrels and the navy blue hearts came out. Such a sweet detail on the yoke of this knit. It’s funny, colour work/intarsia always seemed such a hard thing to do when knitting. In fact, once you get the hang of it it’s really easy! I just haven’t found a solution yet when using four colours at once (a problem I am encountering with a current WIP). I managed to find matching pink buttons at TextileGarden, which work really well and finish the cardigan off nicely. The pattern of course is from the team at DROPS Design. And my friend loved it for her little girl. The neckline was a little big, which I also thought when I was knitting it, but because of the colour work it could be tricky to change it. If I were to knit this again I would add a couple of rows in single colours between the colour work to decrease some stitches. Pattern: Baby Squirrel by DROPS Design. Yarn: DROPS Baby Merino in navy blue, light sky blue, old pink and off white. Knitting time: 1st-15th May 2015. Another pair of booties I knitted back in 2015. These were knitted for a friend that used to lead the Forest School session that I attended with Luke. She had a baby boy in 2015. I used some leftover DROPS Muskat cotton yarn from my stash. I chose cotton as he was a Summer baby. These booties only take me about 2 hours to knit up, so they are a great item to gift when I need to make something quickly! And of course I also made the box that they are gifted in. Pattern: Baby booties, my own pattern. Yarn: DROPS Muskat in apple green and light mint. Knitting time: 8th August 2015. Last year a friend who’s son I used to look after had another baby boy. I knit up this trouser and vest combination, using cotton yarn. I was able to use some leftover DROPS Muskat cotton yarn that I had in my stash, and I love the colours I was able to put together. It’s a great pattern from the DROPS Design team, which I have been eyeing up for a while, but this is the first time I’ve made it. The pattern, like a lot of the DROPS Design patterns, is knitted in the round. But this one is knitted from the waist down. This can be very useful when wanting to adjust length, but in this case I stuck to the 6-9 months sizing. The ribbing at the top continues down the outside of each leg and finishes in the cuffs at the bottom. This makes these trousers quite stretchy. The second item I made for my friend was a little vest/waistcoat to match. This is another DROPS Design pattern that I’ve had on my radar for a while, but yet again this is the first time I have knitted it. It’s a great and very simple vest, but I love the sweet little details of the picot edging, which I love on a baby boy as much as on a baby girl. I picked these blues and stripes as they look adorable on little babies. And here are both garments together. I was very pleased with them and my friend loved them too for her little man. Pattern: Baby trousers by DROP Design. Yarn: DROPS Muskat in blue, apple green and light mint. Knitting time: 25th-28th April 2016. Pattern: Honey Suckle by DROP Design. Yarn: DROPS Safran in navy blue and light blue purple. Knitting time: 23rd-25th April 2016. In Germany it’s Nikolaustag today. This means children clean their boots/shoes and leave them by the window or the door on the night of 5th December. The next day they wake to small gifts and goodides stuffed into their boots, which were left by Sankt Nikolaus. As I grew up with this tradition Luke and Max will continue to receive their Nikolaus gifts on the 6th of December. So to honour that tradition, today I am posting about four pairs of booties knitted for a friend that went to Forest School with us. She had a baby boy in 2015 and I knit up some blue baby booties for her (please excuse the terrible pictures, I am not sure what happened there). Because my friend liked the booties so much, she ordered another three pairs from me. They are my version of Saartjes Bootees, and I know I HAVE to write down this pattern, I really must. I have promised it to a few people, so it needs to happen soon! Yarn: DROPS Merino Extra Fine in dark blue, purple, heather and red. Last week I showed one of the Taiga Hilliard dresses I have knitted, here is another one. This is the Marian dress, which is yet another brilliantly written pattern from Taiga Hilliard. Taiga writes her patterns very well, they are easy to follow for American, British and any other knitters. My favourite part about the patterns is that there is absolutely minimal sewing at the end. for this one it was just adding crochet hoops for the buttons and sewing in ends, and then sewing on buttons, that was it! Brilliant! I had these sweet little buttons in my stash, they fit perfectly, matching the lacy pattern down the middle of the front and back panels of the dress. Although I don’t think they are very easy to close…oops. It’s so sweet how the detail of that lacy pattern fans out to create the fuller skirt. I made this for a really old friend, who is actually the daughter of my kindergarten teacher. She was kind enough to send me some pictures of her sweet little girl wearing her dress. Pattern: Marian Dress by Taiga Hilliard. Yarn: DROPS Cotton Viscose in light grey green. Knitting time: 20th-21st March 2016.